BEWARE OF CHEAP CHINESE JUNK THAT WILL WEAR OUT PREMATURELY. AND CAUSE GREAT POTENTIAL DAMAGE TO YOU AND YOUR MOTORCYCLE. (SPECIFICALLY THE ENGINE CASES WHEN THE CHAIN BREAKS). 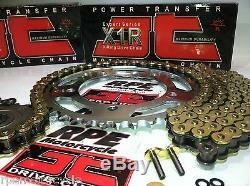 Complete High Performance 530 Chain & Sprocket Kit. 530 size is 2.5mm wider than stock ZX-10r 525 size, and has always been the oem size drive gear. On Honda CBR1000rr , Suzuki GSXR1000 and Yamaha R-1. The oem 525 kit weighs approx one and a half pounds less, but wears out much quicker! This 530 conversion kit makes available the same maximum strength and long life drive gear. That the other brand big bore superbikes enjoy, and your ZX-10r deserves. Gear Ratio Options Available with this kit. Quick Acceleration 16/40t or Extreme Quick Acceleration 16/41t. OEM'06/07 ZX-10r Ratio 17/40t or Freeway Gear Ratio 17/38t. Sizes listed below will be sent. 17 tooth Front & 40 tooth Rear sprockets. (SCM420 Chromoly Japan Steel Front and C45 high carbon Japan Steel Rear). And a high strength Gold 530 x 114L X-Ring Chain. X-Ring Chain is also available in BLACK by request. (JT calls it Black, but it's more like Dark Silver). Leave note in "Add Message" tab during checkout to request optional Silver chain or optional size sprockets. Call RPE to special order. Unless otherwise specified, Chain & sprockets are sent OEM'06/07 size with Gold JT chain and a. JT Chain is also available in BLACK by request. For reference ; Original Equipment stock sizes as supplied from Kawasaki are.. Sprocket, 39t Rear Sprocket (39t is NOT available in 530). For QUICK ACCELERATION gear ratio kit (quick off the line, quick roll on's, wheelies), use a 16t (-1t) front sprocket and a 40t (+1t) rear sprocket. Request during checkout in "Add Message" tab this 16/40t QA Kit. Note; Your top gear cruising rpm's will be higher, and your top speed will be lower with this quick acceleration kit. A 17t oem front sprocket will fit with the same chain length that is used with the 16t if you ever want to go back to stock gear ratio. For EXTREME QUICK ACCELERATION gear ratio kit (crazy quick off the line, wicked roll on's, way easier wheelies). REQUEST Extreme QA Kit 16t (-1t) front sprocket AND a 41t (+2t) rear sprocket. Request this 16/41t EXTREME Q. Kit in "Add Message" tab during checkout. Your top gear cruising rpm's at 70mph will be even higher than reg. Top Speed will be lower. If you ever want to go back to a less radical gear ratio, you can always put a 17t front sprocket back on with the same chain length provided. 06/07 ZX10r Original Factory Supplied OEM RATIO size sprockets are the calculated "Happy Medium" of off the line acceleration, roll on's, and high speed engine rpm's with the least amount of compromise on either top end or low end acceleration. Available 520 or 525 sizes (narrower, chain and sprockets) do NOT affect final drive ratio, only changing number of teeth on sprockets actually changes gear ratio. If you just want an upgraded STRONGER final drive components kit , and are using your entire gear box ratio as it is from Kawasaki, then this OEM'06/07 17/40t OEM sprocket sizes is for you. This OEM'06/07 ratio kit is the default gearing that will be sent unless otherwise specified. For FREEWAY GEARING gear ratio kit (Faster top speed, lower top gear cruising rpm's, less wheelie prone), use a 17t (oem) front sprocket and a 38t (-1t) rear sprocket. Request during checkout in "Add Message" tab this 17/38t Freeway Gearing Kit. Note; Your top gear cruising rpm's will be lower, and your top speed will be higher with this freeway gearing kit. A -1t front sprocket only change is EXACTLY the same ratio change as +3t rear sprocket only change. A -2t front sprocket change is EXACTLY the same ratio change as +6t rear sprocket change (Very Extreme QA) Not Available! +1t rear combination is EXACTLY the same as a +4t rear only change with stock front sprocket. A 520 size chain is approx. Than a 525 chain, and 4mm. Less mass equals lighter weight equals easier to spin, but the ratio (teeth size) change makes the big difference. The sprocket width matches the chain width where it rides on the sprockets, thus a 520 chain must use 520 sprockets, and a 525 chain must use 525 sprockets, etc.. RPE Motorcycle has chain and sprocket conversion kits available in 520 , 525 , and 530 sizes for most motorcycles. A larger rear sprocket number of teeth size requires a longer chain, however +1 or -1 tooth on the front sprocket only will use the same chain length. Available JT 530 Sprocket Sizes. Sprocket also available in 530 x 16 or 17 teeth. Sprocket available in 530 x 38, (NO 39t) , 40 , 41, 42 , 43 , 44 , 45 and 46 teeth. Black 530 all Steel Supersprox also available in 520 , 525 or 530... CALL for Availability and Price! Also available in maximum strength / lighter weight Aluminum inner carrier with steel outer teeth. CALL FOR PRICE AND AVAILABILITY! Also available by special order; Optional Color Stealth Sprockets Red , Blue & Black. Optional sprockets NOT included in this advertised JT Steel kit price. OPTIONAL SPECIAL ORDER COLORS COST MORE. Gold Stealth sprocket is usually in stock. Extended length chains in 150L+ are available in RK and DID (Not JT Chain)!! CALL FOR PRICE & AVAILABILITY on YOUR SIZE! (we know exactly how much extra length chain is necessary for +3, +6, +8 or +10 extended swingarms). (Custom order kits or special order colors may take longer). Only the advertised JT Chain and Sprocket kit is the advertised price shown. All 530 JT chains include a RIVET type master link. Also available from RPE Motorcycle... Tool is NOT included with Chain and Sprockets Kit. Complete chain tool for most 520, 525 and 530 standard and o-ring chains. Break, press and rivet your chain with one compact tool. Will rivet hollow nose master links (will not rivet solid soft-nose pins). Will push pin completely through link/side plate. Hardened body, riveting tip and breaker pin for strength and durability. Removable handle for compact storage. Perfect for trail/road tool pack if you have a chain with a rivet master link. 10725 Beverly Bl, Whittier, CA 90601. Hours: M-F 9-6, Sat 9-5 Pacific Std. Full Service, Parts, and Accessory Store for all street motorcycles Will calls, and Installation appointments welcome! DELIVERED to AUSTRALIA in 7 days! JT Chains and Sprockets, the leading edge technology in production and materials with total dedication to excellence gives you the ultimate motorcycle sprocket and chain range at unbeatable value. Our mission is to supply you the most innovative and competitive product line fully backed by complete availability and service. X-Ring construction reduces friction by twisting between the side plates instead of being squashed. Normal O-Rings and other makers modified O-Rings have squashed points that increase friction. The low friction X-Ring disperses the pressure and minimizes power loss. X-Rings have the greatest wear resistance of any other type of O-Ring or Non-O-Ring chain. We are committed to supplying the most durable, best quality drive components available in the marketplace worldwide. This is why we produce and sell more sprockets than all the other aftermarket brands combined. JT sprockets are made using only the best available materials. The JT Sprockets factory is the largest and most advanced in the world. It is fully equipped with high accuracy machinery, including the latest generation of CNC computer design and computer controlled metal cutting equipment. The essence of a high quality sprocket is in the high precision of manufacturing and the inherent quality of the material. Through accurate machining, JT ensures maximum durability and performance. JT Sprockets are manufactured the right way by hobbing, machining and drilling. This is the only proven way to achieve the closest of tolerances and the most accurate teeth profiles. Heat treated and hand finished to perfection, all JT sprockets meet or exceed the highest possible quality standards set for the motorcycle industry. Every sprocket goes through up to 25 production stages and 10 individual quality control checks before it is ready to leave the factory and the production facility has achieved the highest European quality standards. The item "ZX10R NINJA'11-15 JT GOLD X-RING 530 CONVERSION CHAIN AND SPROCKETS KIT ZX-10R" is in sale since Monday, June 26, 2017. This item is in the category "eBay Motors\Parts & Accessories\Motorcycle Parts\Drivetrain & Transmission\Other Transmission Parts". The seller is "rpemotorcycle" and is located in Whittier, California.